The MonRepos Park was once impartially called "a scenic work of nature and art". It's the exceptional beauty of the site, the unique wilderness of rocky, marine and wooded landscapes completed with tactful and masterly interference of artists and designers, that makes the MonRepos Park a place worth a visit. The park, bearing the official status of a national historic and architectural landmark and natural reserve museum, is located in the northwest part of Tverdysh island on the Gulf of Vyborg coast not far from the town of Vyborg and occupies 180 hectares. 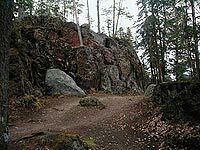 The local legends say it is here that an ancient settlement of the Karelians was laid to become the town of Vyborg some day. The historic part of the reserve takes a visitor back to the 18th-early 19th centuries. The memorial estate and park ensemble includes the Manor and Detached Library - rare examples of classical style in wooden architecture - and the landscape rock park laid in romantic tradition. The estate owners commissioned many popular architects and park planners working in St. Petersburg in the late18-early19th centuries to create this unique monument of architecture and nature. Auguste Montferrand known for designing and building St.Isaac's Cathedral, Thomas de Thomon who created the Spit of Vasilievsky island ensemble with the Rostral columns, Pietro Gonzago who laid out the Pavlovsk park and decorated the Pavlovsk palace are just a few names in the row of the MonRepos authors. 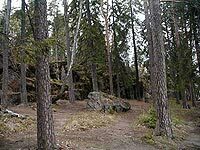 From the north and south, the historic core of the park smoothly turns into a forestlike zone of a natural landscape that belongs to the specific geographical region having the name of Fennoscandia. It is notable for Glacial Period formations of up to 20 m height made up of a peculiar sort of granite. 48 species of plants falling under the category of being conserved in Leningrad region, as well as rare mosses and lichens can be found in the MonRepos Park. The fauna of the natural reserve includes 34 species of birds and mammals.